New York based artist, Todd DiCiurcio, combines both his passion for music and art by creating mixed media drawings based off live musical performances. Using ink and graphite DiCiurcio depicts the immediacy of modern culture by rendering the live performances of contemporary musicians. Created entirely in one continuous line and during single sessions, his drawings are spontaneous and unique artistic manifestation of performances themselves. DiCiurcio is highly involved in the vibrant music scene, which allows him to document both major and underground artists who are representative of this generation’s cultural current. Some of the bands DiCiurcio worked with include Guided by Voices, Edward Sharpe and the Magnetic Zeros, Bon Jovi, Kings of Leon, Dinosaur Jr., Bob Mould, Broken Social Scene, Exitmusic, The English Beat, Grizzly Bear, BP Fallon, The Killers and many others. 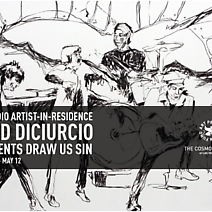 DiCiurcio was selected as artist in residence at P3 Artist Studio Space in the Cosmopolitan Hotel, Las Vegas where he transformed the space into a working studio for artists and performers to experiment together. His work has recently been acquired by Tommy Hilfiger Inc. for the VIP room in the new Los Angeles flagship boutique.